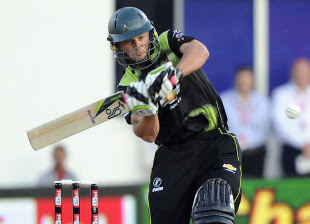 Warriors SA 158 for 6 beat Victoria Bush Rangers 130 for 9 by 28 runs at Port Elizabeth, to score 2 on 2. Davey Jacobs the skipper of Warriors, single handedly, annihilated tournament favourites, Victorian Bush Rangers, scoring a blistering 59 of 39 balls, taking two breathtaking catches at crucial moments and marshaling his bowling resources well. A good opening partnership of 81 in nine overs between Jacobs 59 of 39 and Prince 16 of 42, should have taken the Warriors to a score of 190-200. This was not to be as the Victorians pegged the Warriors with some sustained medium pace, to restrict them to 158 for 6 at twenty. Boucher made a gritty 31 of 44 supported by Botha 20 of 27. Nannes who went for plenty in the first two overs, came back strongly for 1 of 25. McDonald bowled brilliantly for his 2 of 22. Harwood and McKay finished with a wicket apiece. For the Victorians, Quiney fell for one at the third over.The danger man Hodge was caught acrobatically by Jacobs, for 16 in the fifth over. Finch and Hussey played sensibly to take the score to 59 by 9th over, when Jacobs again came up with a breathtaking catch to dismiss Finch for 25 of Boje. Hussey fell at 94 for a well made 29 of 39. This opened the flood gates as further five wickets fell for an addition of eleven runs in little over three overs. Some lusty blows by Harwood at the end did not prevent the Warriors from taking the match by 28 runs. All the Warrior bowlers bowled well, with Theron getting 3 for22, Ntini 2 for 33, Tsotsobe,Boje, Botha and Kreusch taking a wicket apiece. Warriors with 2 on 2 are well placed for a position in the semis.